Naval Air Station, North Island is part of the largest aerospace-industrial complex in the Navy. It includes Naval Amphibious Base Coronado, Outlying Field Imperial Beach and Naval Air Landing Facility, San Clemente Island. The complex's 5000 acres in San Diego and 130 commands bracket the city of Coronado from the entrance to San Diego Bay to the Mexican border. North Island itself is host to 23 squadrons and 75 additional tenant commands and activities, one of which, the Naval Aviation Depot, is the largest aerospace employer in San Diego. North Island was commissioned a naval air station in 1917, 82 years ago. On August 15, 1963, the station, which was originally called the Naval Air Station, San Diego until 1955, was granted official recognition as the "Birthplace of Naval Aviation" by resolution of the House Armed Services Committee. There are some 165 nuclear aerial bombs stationed at Naval Air Station North Island storage facility in San Diego, California. Another 65 W-80-0 Tomahawk SLCM munitions are distributed between this storage facility and the Laplaya Annex Naval Weapons Station in the Point Loma area of San Diego. As jet aircraft performance increased, they became increasingly challenged by the combination of community encroachment and airspace restriction at NAS North Island. The field's assigned aircraft now include the S-3 and the H-46 and H-60 helicopters. The E-2 community has relocated to NBVC Point Mugu while higher performance aircraft have been relocated to less confined installations such as MCAS Miramar and NAS Lemoore. Nevertheless, North Island offers a variety of unique advantages. 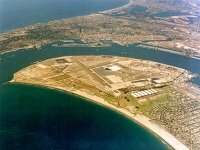 In particular, with the closure of NAS Alameda, North Island is the only Navy airfield on the West Coast that is collocated with the piers serving its fleet carriers. The station's location is also a significant factor in its encroachment situation. NAS North Island occupies approximately 2000 acres at the north end of the Coronado Peninsula. Immediately adjacent south of the field is some of the most expensive and exclusive residential and resort property in the nation. In accommodation of the adjacent communities, NAS North Island's precision radar final approach course is offset eight degrees from runway centerline. Airspace encroachment is also a serious issue at NAS North Island. The field's proximity to San Diego Lindbergh Field means that many activities are conducted on an "either/or" basis, with one facility having to defer to the other's traffic. NAS North Island must accommodate this situation by conducting almost all of its activity south of the field; however, this can exacerbate the tenuous noise relationship with its influential neighbors. San Diego International - Lindbergh Field is 3 nm from North Island NAS. Lindbergh Field is a civilian airport with congested air traffic. Annually, 5,923,000 passengers enplane at the airport. The airspace around San Diego is designated Class B airspace. Class B airspace is that airspace that surrounds an airport with high density air traffic. It is developed to reduce the midair collision potential by providing an area in which all aircraft will be subject to certain operating rules and equipment requirements. Only seven years after the Wright Brother's first flight, a Curtis airplane landed on North Island. That same year, 1910, North Island became the birthplace of naval aviation when Navy Lieutenant Theodore Ellyson transferred here to receive flight instruction from the Curtis Aviation Camp. At that time, North Island was an uninhabited sand flat. It had been used in the late 19th century for horseback riding and hunting by guests of J. D. Spreckles' resort hotel the now famous Del Coronado. Seven years later, the Naval Air Station, North Island, was established. North Island derived its name from the original geography. In the nineteenth century, it was referred to as North Coronado Island. In 1886, North and South Coronado Island were purchased by a developer for development as a residential resort. South Coronado became famous as the city of Coronado, but fortunately for the Navy, North Coronado was never developed. Instead, Glen Curtiss opened a flying school and held a lease to the property until the beginning of World War I. In 1917, Congress appropriated the land and two airfields were commissioned on its sandy flats. The Navy started with a tent covered city known as "Camp Trouble". As you can tell by its name, things did not always go well in the early days. The Navy shared the island with the Army Signal Corps' Rockwell Field until 1937, when the Army left and the Navy expanded its operations to cover the whole island. In 1914, then unknown aircraft builder, Glenn Martin, took off and demonstrated his pusher aircraft over the island with a flight that included the first parachute jump in the San Diego area. The jump was made by a ninety pound civilian woman named Tiny Broadwick. Other aviation milestones originating at North Island included the first seaplane flight in 1911, the first mid-air refueling and the first non-stop transcontinental flight, both in 1923. One of history's most famous aviation feats was the flight of Charles A. Lindbergh from New York to Paris in May, 1927. That flight originated at North Island on May 9, 1927, when Lindbergh began the first leg of his journey. Forefathers of today's "Blue Angels", the three plane "Sea Hawks" from VF-6B, the "Felix the Cat" squadron, were thrilling audiences with flight demonstrations as early as 1928. They demonstrated the training skills of Navy fighter and bomber pilots and on many occasions, flew their aircraft in formation with the wings tethered together. The list of American military pilots trained at North Island reads like the Who's Who of aviation; however, America was not the only country interested in aviation early in the twentieth century. Six years before the Naval Air Station was commissioned, Glenn Curtiss, the famed aviation pioneer and later aircraft manufacturer, trained the first group of Japanese aviators at his flying school on the Island. Among them was a LT C. Yamada would later become infamous as the head of Japan's Naval aviation in World War II. Even the base's first commanding officer, Lieutenant Commander Earl W. Spencer Jr., USN, added a degree of celebrity to North Island. His wife was Wallis Warfield, a prominent socialite who was to remarry twice and finally become Wallis Warfield Spencer Simpson Windsor, the late Duchess of Windsor, for whom King Edward of England gave up his throne in 1936. During the Second World War, the land between North and South Coronado, called the Spanish Bight, was filled a part of the base where most of the administrative and recreational buildings now stand. When approaching Flag Circle from the front gate, the last tiled roof building on the left was the original gate guard building as evidenced by the Army Air Corps insignia, a pair of flight wings bisected by a single blade propeller, carved in the window shutters. During World War II North Island was the major continental U.S. base supporting the operating forces in the Pacific. Those forces included over a dozen aircraft carriers, the Coast Guard, Army, Marines and Seabees. The city of Coronado became home to most of the aircraft factory workers and dependents of the mammoth base which was operating around the clock. Major USO entertainment shows and bond drives were held weekly at the Ship's Service auditorium which was later replaced by the 2,100 seat Lowry Theater. Big band singers and movie stars were stationed here or on ships homeported here during the war years including Douglas Fairbanks Jr. Future television cowboy star of the 50s and 60s, Guy Madison, who starred as Wild Bill Hickok, was still Seaman Bob Mosely, a lifeguard at the NAS crews' pool. Stars like the Marx Bros and Bob Hope appeared regularly at USO shows at the auditorium. NAS North Island also operates two other airfields in the Southern California region. One is Naval Auxiliary Landing Facility (NALF) San Clemente Island, located 70 miles northwest of San Diego in the California Channel Islands. The other is Outlying Field (OLF) Imperial Beach, located 10 miles south of the base on the U.S.-Mexican border. The air station resembles a small city in its operations. It has its own police and fire departments. It has large factories such as the Naval Aviation Depot, employing 3,800 civilians and its own parks, beaches, housing and recreation areas. Its airfield has over 235 aircraft and its quay wall is home port to two major aircraft carriers, USS Constellation (CV 64) and USS John C. Stennis (CVN 74), America's newest nuclear powered carrier. 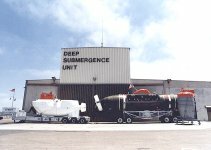 Additionally, the base is home to the Navy's only Deep Submergence Rescue Vehicles, Mystic (DSRV 1) and Avalon (DSRV 2). The DSRV motor vessel support ships is also homeported here. North Island is headquarters for six major military flag staffs including: Commander Naval Air Force, U.S. Pacific Fleet, responsible for maintenance and training of all naval aircraft and aircraft carriers in the Pacific Fleet, Commander Third Fleet, responsible for the defense of the western approaches to the U.S. and the direction of joint, combined, intertype and fleet exercises in the eastern Pacific Commanders Carrier Group One and Seven and Commanders Cruiser Destroyer Group One and Five. With all the ships in port, the population of the base is over 30,000 active duty, selected reserve military and civilian personnel. The mission of Naval Computer and Telecommunications Station, San Diego is to provide support to fleet and shore commands through rapid reliable and secure communications, quality information technology, and cryptologic services. NCTS San Diego serves fleet and waterfront customers. Prior to 1 July 1971, Data Processing was performed by each individual Naval Air Station and command within the San Diego area. In March 1972, several of these facilities merged, and the consolidated organization was called the Aviation Data Processing Service Center (Aviation DPSC). 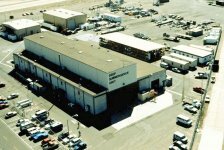 In January 1973, the Aviation DPSC merged with the three San Diego Naval Air Stations and became the Data Processing Service Center Pacific (DPSCPAC). 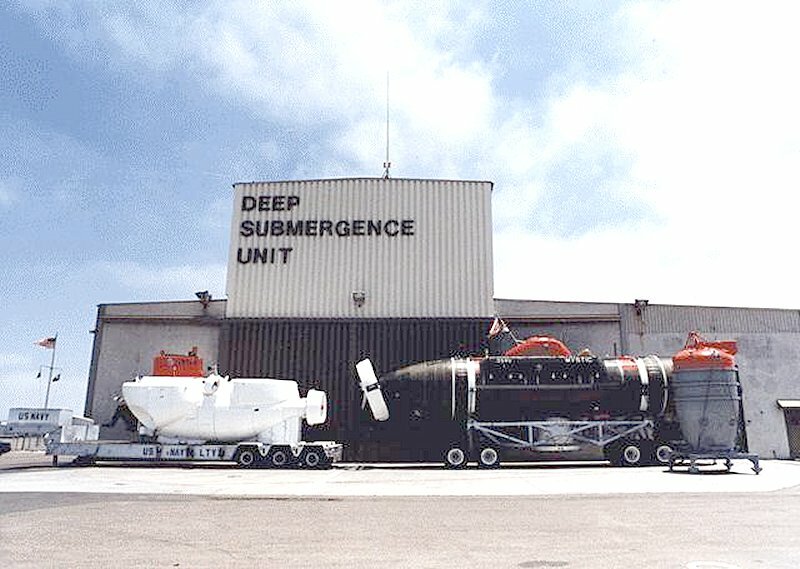 DPSCPAC remained in existence until 1 October 1978 when further consolidation produced the Navy Regional Data Automation Center (NARDAC) San Diego. At that time, NARDAC San Diego provided business and logistics data processing services to the San Diego area Navy commands and telecommunications services to Navy customers throughout the United States. NARDAC moved into a new data processing center on 28 July 1987. This service center was named in honor of Rear Admiral Grace Murray Hopper, USNR-R, the legendary "First Lady" of data processing. In July 1989, the Chief of Naval Operations proposed the integration of Automated Data Processing (ADP) and communications within the Navy. This brought on the merger of the NARDAC and the Naval Communications Station San Diego. On 2 November 1990, both activities were disestablished and the components merged to form the Naval Computer and Telecommunications Station (NAVCOMTELSTA) San Diego. AUTODIN, the official message system of DoD since the 1960s, closed by the end of calendar year 2000. DMS implementation began during 1996 as the backbone infrastructure is developed and activities involved in initial test and evaluation (IOT&E) of DMS contract products begin to cut over. DoN activities involved in IOT&E include CINCPACFLT and COM NAVSURFPAC, as well as NCTAMS EASTPAC, NCTS San Diego, Quantico and COMOPTEVFOR. The history of the Naval Aviation Depot (NADEP) North Island covers almost the entire lifespan of Naval aviation. The Depot began as the Assembly and Repair Department of the Naval Air Station in 1919; became a separate command known as the Naval Air Rework Facility in 1969; and changed to its current name in 1987. Today, NADEP North Island is recognized throughout the world as an innovator in depot support. With 3,900 personnel, NADEP North Island is one of the largest employers in San Diego, California. This full-service, world-class Depot handles maintenance engineering, logistics, and manufacturing services to the Fleet, and achieved $488 million in revenues for 1997. Although the focus is on aircraft, engines, and related component parts for aviation, the Depot is increasing its support to the Navy's amphibious, surface, and submarine forces. NADEP North Island provides engineering, calibration, manufacturing, overhaul, and repair services as well as administers engineering/airframe authority for the F/A-18 Hornet (including those flown by the Navy's Blue Angels), F-14 Tomcat, E-2C Hawkeye, C-2 Greyhound, and S-3 Viking aircraft programs. The Depot also dispatches field teams to deployed ships and military installations worldwide. These teams repair structures and components of aircraft; catapult and arresting gear on aircraft carriers; and aviation equipment and facilities on most classes of ships. Among the best practices documented were NADEP North Island's engineering development and structural analysis training program; consolidated control centers; plastic media blasting; and F/A-18 center barrel replacement. Of all the aviation depots, North Island is the most diversified and most experienced in years of service. NADEP North Island prides itself on its ingenuity and teamwork. Constantly improving systems and tailored processes ensure that customers receive the highest quality product at the best value. A multi-talented, dedicated, and accomplished workforce enables NADEP North Island to exceed this goal. In addition to its primary mission, the Depot provides outstanding community outreach programs; participates in local educational partnerships; and advocates environmental and conservation efforts. As a result, NADEP North Island has received numerous awards including the 1997 California U.S. Senate Productivity Award for Manufacturing; 1997 Secretary of Defense Environmental Quality Award; 1996 Total Excellence in Management Award from the San Diego Business Journal; 1994 California Women in Government Award; and 1993 Rochester Institute of Technology/USA Today Quality Cup Award. The Navy has established a Pacific Fleet Force Structure consisting of six aircraft carriers. Home port capabilities for five of these vessels have been established at Navy installations in the continental United States. Home port facilities and infrastructure for two conventionally powered carriers (CV) and one nuclear powered carrier (CVN) currently exist at Naval Air Station North Island (NASNI), Coronado, California; home port facilities and infrastructure for one CVN exist at Naval Station Everett (NAVSTA Everett), Washington; and home port facilities and infrastructure for one CVN exist at Puget Sound Naval Shipyard (PSNS), Bremerton, Washington. Facilities and infrastructure exist in Japan to accommodate a forward-deployed CV. As aging CVs reach the end of their service life and are replaced by CVNs, the Navy has a need to create the capacity to home port these new CVN assets. The US Pacific fleet is currently undertaking the replacement of two such CVs within the US Pacific Fleet area of responsibility (AOR). Of the six aircraft carriers homeported in the US Pacific Fleet, three are currently NIMITZ-class CVNs. The CVN is a newer class of aircraft carrier requiring different homeporting shore infrastructure (e.g., electrical power and water depth). In July 1999 the Navy completed a Final Environmental Impact Statement (EIS) designed to determine the appropriate homeports for three Nimitz-class nuclear-powered aircraft carriers in the Pacific Fleet. The EIS process is required by the National Environmental Policy Act (NEPA). The in-depth EIS process began in December 1996. Following public meetings held in communities at each of the four alternate locations in February 1997, the Navy spent more than 18 months examining the ports to determine how well they satisfied the CVN Homeporting Objectives and Requirements as they pertain to Operations and Training; Facilities and Infrastructure; Maintenance; and Quality of Life. The study also analyzed the potential environmental effects for each of the alternatives considered. In August 1998, a Draft EIS was released for public review. The Navy's preferred alternative was to upgrade the current facilities and infrastructure at NASNI (which has the homeport capacity to support one CVN and two CVs) with the additional capacity required to support a total of three CVNs and would maintain the existing CVN homeport capacity at NAVSTA Everett. The Navy's preference for this home port combination is based on NASNI's accessibility to the sea and training ranges; PHNSY's inaccessibility to training ranges and the lack of facilities to support a carrier air wing; and the operational and quality of life advantages of the existing CVN home port at NAVSTA Everett and the assumption that depot maintenance for that CVN can be successfully completed without a significant adverse impact on crew quality of life or maintenance schedules and costs. The transient berth at NASNI provides direct land access from the ship berth to an airfield for air wing logistic support, including aircraft onloads and offloads for Pacific Northwest homeported CVNs. The majority of the CVNs' underway training is off southern California (SOCAL) and the only carrier access to a West Coast airfield is at NASNI. Therefore, it is essential that transient CVNs remain able to moor temporarily at NASNI to load and off-load their air wing. The official Ribbon Cutting Ceremony for the new Carrier Berthing Wharf at Naval Air Station North Island was held on 20 May 2002. The new wharf was constructed to support nuclear-powered aircraft carriers. Currently, the USS John C. Stennis (CVN 74) and USS Nimitz (CVN 68), as well as USS Constellation (CV-64), a conventional powered aircraft carrier, are stationed at NAS North Island. In addition to the new wharf, a storage warehouse, equipment staging building, and a fleet recreation center was also built. The 90-feet wide by 1,300-feet long wharf runs parallel with navigation channel in the San Diego Bay, and connects to a original carrier pier completed in 1998. The joint venture construction team of Nova Group of Napa, Calif., and R. E. Staite, a San Diego-based heavy marine contractor, was awarded the construction contract. Included in the construction package was demolition and removal of ferry landing pier, civil, mechanical and electrical utilities work, paving and site work, dredging, environmental mitigation and enhancement, and all incidental-related work at Naval Air Station, North Island. The entire construction project was carried out under a community-friendly method to both the cities of Coronado and San Diego. The Navy avoided having more than 18,000 truck trips through the streets of Coronado and across the Coronado Bridge by establishing a temporary cement-making plant and using barges and small craft to shuttle more than 130,000 tons of rock, sand and gravel needed for the wharf construction. The wharf is designed to capture all stormwater and pass it through a treatment system. Each outfall on the wharf is equipped with an Aqua-Swirl TM Concentrator which has been sized to provide a highly effective means for the removal of sediment and free floating oil and debris. Besides gaining a new carrier homeport site, the Navy also created a unique habitat enhancement area. The P-700A project made beneficial use of materials dredged during pier construction by creating a 25-acre inter-tidal/sub-tidal habitat site in San Diego Bay south of Naval Amphibious Base (NAB) Coronado. More than 500,00 cubic yards material dredged from the construction site was pumped from the air station to the enhancement site using a hydraulic dredge pumping system. Dredged material was pumped through a four-mile submerged pipeline. The habitat created serves a variety of water and shore birds, including the endangered western snowy plover and California least terns, as well as a wide variety of marine life that are able to forage for food. The site also includes rocky fish habitat structures along its northern edge to further increase biodiversity. This is the largest enhancement project ever in San Diego Bay. Since the early 1900s, San Diego Bay has lost nearly 90 percent of its inter-tidal area. This project, which created 8 acres of inter-tidal habitat, represents the first time an effort was made to bring some of that area back. Coastal America honored a seven-member multi-disciplinary team from Southwest Division, Naval Facilities Engineering Command with a 2001 Coastal America Partnership Award for their work in planning and developing the enhancement site to protect and restore the ecosystem. The Navy also created two new eelgrass beds: one at the south bay enhancement site and at a 1.5-acre mitigation site along the northern edge of NAS North Island. U.S. Fish & Wildlife, California Coastal Commission, U.S. Fish & Wildlife, San Diego Regional Water Quality Control Board, Army Corps of Engineers & U.S. Coast Guard and other environmental agencies were instrumental in the design phase of the project. By involving these organizations in the design phase, the Navy assured the environmental friendliness of the project and is an excellent demonstration of cooperation with the community.